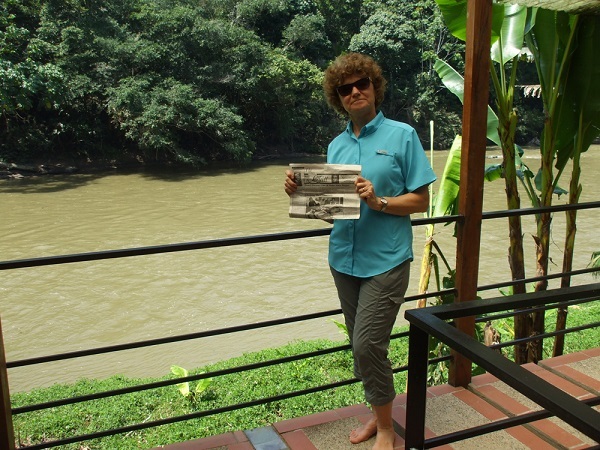 Mary Eipert of Burlington, Iowa, took "The Quill" along to Ecuador, South America. She is standing next to a waterway at the Itamandi Eco Lodge in the Amazon, near Tena, Ecuador. The Amazon produces one-fifth of the Earth's flowing fresh water. This photo was taken last week, while touring Ecuador with her husband Steve Rowland, and two friends. Mary, who grew up in West Point, Iowa, said her sister, Ingrid Waters, subscribes to The Henderson County Quill and shares her paper with her. "I enjoy reading it. It reminds me of the defunct West Point Bee, I read growing up," Mary said. -When you go on a trip, take "The Quill" along, and have your picture taken with it, and send it to us. Let's see where all "The Quill" can travel.